A general trend is that mines of Agromyzidae -by far the most important group of miners among the Diptera- mainly occur on herbaceous plants, while Lepidoptera miners in large majority are to be found on woody plants. Perhaps this preference among the Lepidoptera explains the observation by Klimesch (1957a) that in Austria mining Lepidoptera are hardly found above an altitude of 1300 m. A second, somewhat less sharp trend is that Diptera mines are mostly found before high summer, Lepidoptera mines after that time. Plants contain a great variety of chemical compound aimed at having a deterrent effect of phytophagous insects. The concentration of these compounds vary within a species, and even within a single individual: young leaves and plant parts are more toxic than older ones. It is assumed that also plants, and parts of plants, that are under stress contain less toxins than healthy unstressed plants. Although there are exceptions to this “plant-stress hypothesis”, also in leafminers (Bultman & Faeth, 1987a) it gives a good first explanation of the distribution pattern of miners on trees and herbs (Schoonhoven, Jermy & van Loon, 1998a; Speight, Hunter & Watt, 1999a). Seedlings can heavily be occupied, much more than ever happens in an adult plant. One can think of two, not completely exclusive, explanations. First, these heavily occupied, actually death-bound plants are specimens with a chemical defence mechanism that is too weak for survival, and what we see is natural selection in action. It is also possible that seedlings in general have a still weakly developed chemical defence system; in that case it is just a matter of chance of an individual escapes the fate of the plant in the picture. 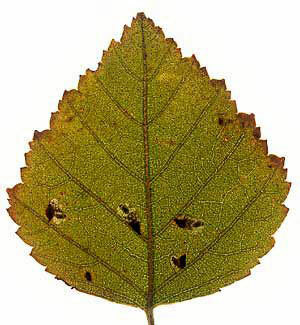 Difference in the degree of toxicity/palatability between leaves of the same plant may also explain why often several mines, sometimes even of different species, may be found on on just one leaf, while a disproportionate number of other leaves are untouched (e.g. Ellis, Kuchlein & Meuleman-ten Broeke, 2001a and literature mentioned there). It seems that we must assume that just a few leaves are palatable among the perhaps thousands on a plant (Lawton, 1986a). This perhaps also explains the sometimes extreme rarity of many miners, even thought their hostplants are neither rare nor small. Think of, for instance Antispila metallella, a miner of Dogwood. The host is all but rare, easily recognised, and is not growing so high that there is a part of the shrub that cannot be inspected. Yet tens of shurbs, with altogether many thousands of leaves have to be inspected in the right season before a mine is found. A small number of species, mainly Nepticulidae are living so late in autumn that their leaves are yellowing, or even at the point of dropping. 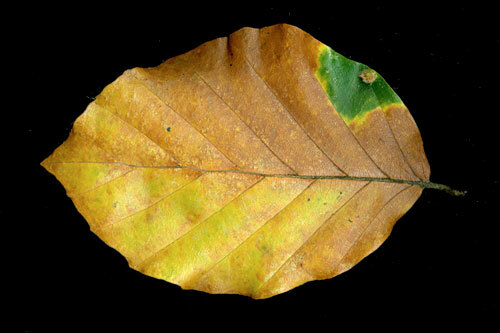 Usually one sees around their mines a clear green zone of healthy plant tissue, that vividly contrasts with the yellow or brown autumn colours of the rest of the leaf. These so called “green islands” are caused by cytokinines, a group of plant hormones that are excreted by the larva, that suppress the aging of the surrounding leaf tissue (Giron ao). Actually, the cytokinines are not produced by the larva itself, but by endosymbiotic bacteria (Body ao; Kaiser ao). An important role is played here by the genus Wolbachia (Gutzweiler ao). 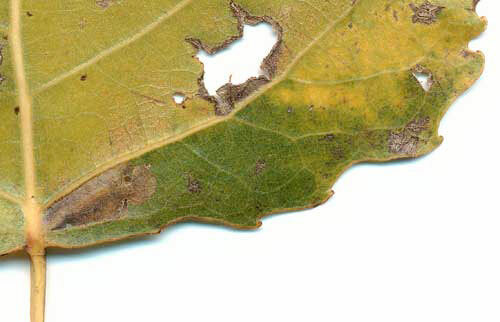 By this mechanism high quality food remains available for the larve, despite the senescence of the leaf. Green islands also greatly facilitate the search for mines in fallen leaves. 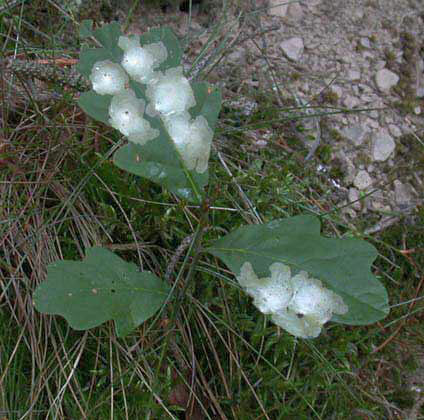 Rarely probably the same phenomon occurs in galls, like in the galls of Aspondylia sarothamni in the pods of broom. Green island around a gall of Hartigiola annulipes on Beech; the gall has just fallen off, the scar remains recognisable. 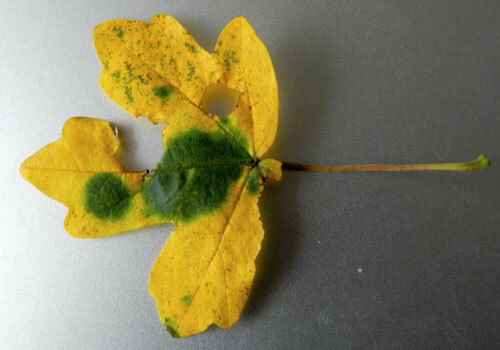 Green islands can also develop in yellowing leaves in the presence of parasitic fungi. The picture below shows an example. Acer campestre, Nieuwendam, 27.xi.2012, leaf infected by the mildew fungus Sawadaea bicornis: the mildew patches are situated at the underside of the green islands. Strangely the mines of Rhamphus pulicarius (a beetle, not a moth, like the preceding example) in yellowing leaves are never surrounded by a green island. Often the larvae in a green island, in a leaf that already has fallen, are so young that is seems questionable is they have any chance of a successful development. 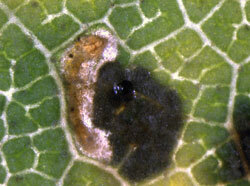 The picture below shows an example: the size of the egg indicates the minute size of this Stigmella larva. Body, Kaiser, Dubreuil ao (2013a), Bultman & Faeth (1987a), Connor & Taverner (1997a), Ellis, Kuchlein & Meuleman-ten Broeke (2001a). Giron, Kaiser, Imbault & Casal (2007a), Gutzwiller (2011a), Gutzwiller, Dedeine, Kaiser ao (2015a), Kaiser, Huguet, Casas, Common & Giron (2010a), Klimesch (1957a), Lawton (1986a), Schoonhoven, Jermy & van Loon, (1998a), Speight, Hunter & Watt (1999a).